As the largest Business and Industrial seller on one of the world’s largest online marketplaces, bidadoo has been awarded eBay’s Top Seller award - in recognition for their rapid growth, pioneering technology, strategic partnerships, and trusted brand. Since bidadoo’s founding 14 years ago, it has been a trusted eBay partner. During this time, bidadoo has become eBay’s top seller in the strategic Business & Industrial segment. This segment serves small and medium sized businesses (SMBs) with equipment and industrial products. “We are excited to be recognized by our trusted partner - eBay. We share a similar DNA and drive to transform the equipment buying experience to one that’s trusted, transparent, and highly efficient for both buyers and sellers. In becoming the largest and most trusted online auction service on the world’s online auction platform, bidadoo continues to serve our sellers by providing them more options, more views per item, more ‘watchers’, more bidders, more efficiency, and more trust - when compared to any other auction company. Over the past year the industrial auction market has changed dramatically, making bidadoo the only national online-only auction company. With our capabilities, recent market consolidation, and eBay’s investment into the online equipment marketplace, we see tremendous opportunity to rapidly scale our business to better serve our sellers and our buyers across the world” says Howard Hawk, bidadoo President. bidadoo was awarded the Top Seller award during the October eBay Top Seller Summit at eBay headquarters in San Jose, California. 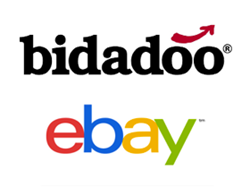 “We see incredible opportunity in our partnership with bidadoo and are excited to build on the 14-year history and collaboration with eBay. We look forward to continuing to invest in this strategic area and see bidadoo as our key partner to continue to bring some of the largest equipment and fleet companies to the eBay platform, and help make eBay top-of-mind for global equipment buyers,” says Pooja Piyaratna, General Manager of Business & Industrial at eBay. If you're interested in viewing the full catalog of items available in this week's auction, please go to http://www.bidadoo.com/auctions. eBay Inc. is a global commerce leader including the Marketplace, StubHub and Classifieds platforms. Collectively, we connect millions of buyers and sellers around the world, empowering people and creating opportunity through Connected Commerce. Founded in 1995 in San Jose, Calif., eBay is one of the world's largest and most vibrant marketplaces for discovering great value and unique selection. In 2016, eBay enabled $84 billion of gross merchandise volume. For more information about the company and its global portfolio of online brands, visit http://www.ebayinc.com.